The 2018 Media Literacy index of the Open Society Institute in Sofia says Balkan countries are the most susceptible in Europe to 'fake' news – owing to their highly controlled media, low educational levels and low levels of trust in society. Balkan countries are the most vulnerable in Europe to the "fake" news and post-truth phenomenon, a new report says, blaming media that are highly controlled by the state or business interests, educational deficiencies and low overall trust levels in society. Those are the main conclusions of the Media Literacy Index compiled by the Open Society Institute, OSI, in Sofia. For a second consecutive year, the index assess the potential to resilience of 35 European societies to disinformation by employing media freedom, education and interpersonal trust indicators, said OSI–Sofia’s European Policies program director, Marin Lessenski. Media freedom is an important factor in tackling the fake news phenomenon – but is often overlooked, he said. Education levels are also crucial when it comes to general education levels and specific media literacy training. There is an observable link between both. “We don’t know for certain what the direction of the relationship is, but we are certain there is one. We supposed that when education or media freedom increases, the other will follow,” Lessenski told BIRN. The author said the index measured resilience to post-truth, fake news and their social consequences; not measure media literacy itself, but the factors that predict it – level of education, state of the media, trust in society and the usage of electronic tools of participation in decision-making by the public. Educational levels are measured by average PISA scores for literacy. According to the 2018 index, Nordic countries are best equipped to resist fake news, mainly because of their high educational and media freedom scores. The report cites Estonia in Eastern Europe as a country with both high education and high scores in media freedom, standing out in the Central and East European region. The index puts all Balkan states in the bottom half of the media literacy scale, with Greece and Romania being the “top” performers in 27th and 28th places, followed by Serbia, Bulgaria, Montenegro, Bosnia, Albania, Turkey and Macedonia. The latter two have the worst scores. According to the report, these are due to very low level of media freedom in Turkey, and the lowest education score in the case of Macedonia. “There is a notable concurrence of worsening factors among all the countries in the region,” Lessenski added. 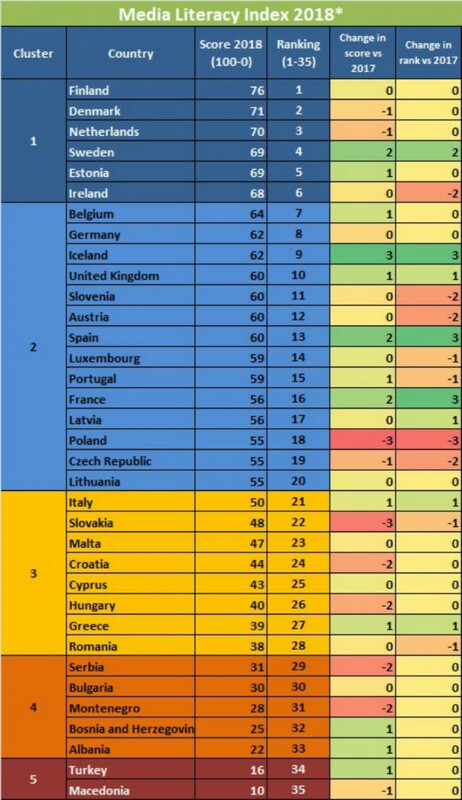 The index sees a slow improvement in the majority of Balkan states since 2017; however, Bulgaria and Romania are stagnating and Serbia, Montenegro and Romania are falling behind. General decline of trust in institutions and in fellow citizens is damaging the scores of the Balkan nations. “Fake news erodes trust and is associated with the growing polarization in society,” the report warned, saying that the phenomenon undermines and erodes the quality of political debates. While the report outlines various regulation and self-regulation proposals to tackle fake news, it says supporting media freedom is the best way forward. “The more controlled the media landscape, the wider net of distortion and far less chances to access diversity of information and viewpoints,” the report concluded. Development of specialized PCVE web site is funded by EU FUNDS CN 2017-386/831 - "IPA II 2016 Regional Action on P/CVE in the Western Balkans"